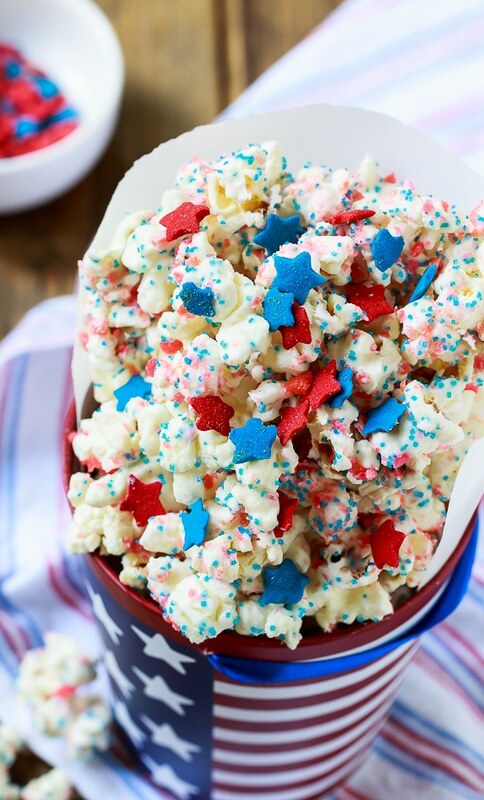 This sweet and salty Firecracker Popcorn is coated in white chocolate and sprinkled with star sprinkles and Pop Rocks to make fireworks in your mouth. It’s a 4th of July treat people won’t be able to stop talking about. 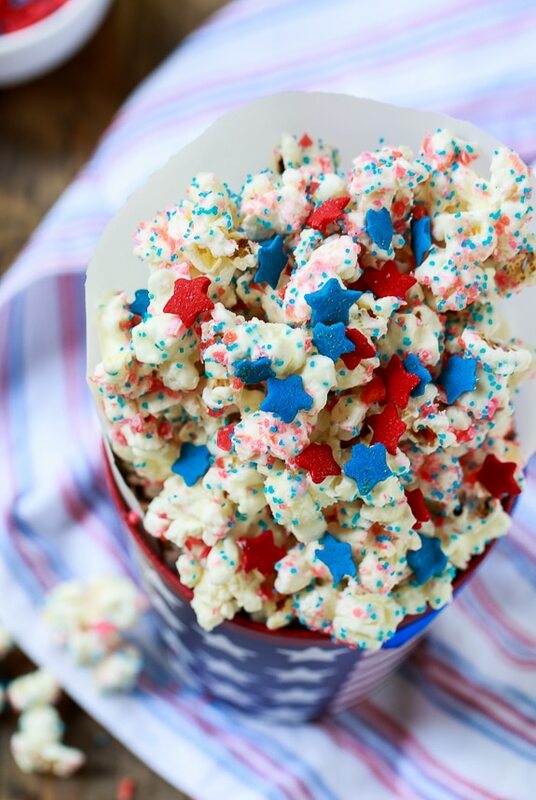 I decided to make this patriotic popcorn after buying a ton of Pop Rocks to make Firecracker Pretzel Rods. It was just an afterthought, but I think Firecracker Popcorn is my favorite 4th of July treat to date. It couldn’t be easier to make. Just pop a bag of microwave popcorn. Toss it with melted white chocolate. It’s best to do this with your hands. Have your kids do it if you don’t feel like getting messy! They’ll love it. 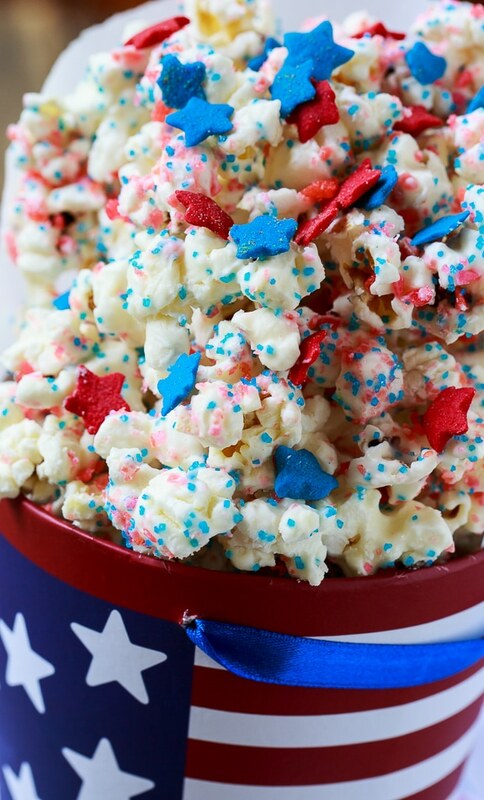 Then sprinkle 4th of July sprinkles and red Pop Rocks all over the coated popcorn before the white chocolate sets. You can use blue Pop Rocks too, but I find they look a little more green than blue. Look for Patriotic sprinkles at Michael’s Craft Store, Jo-Ann Fabric and Crafts, or order from Star Sprinkles Amazon. Hand a bag of this Firecracker Popcorn to all the kids at your 4th of July party and prepare to hear lots of giggles. This popcorn is so much fun to eat! 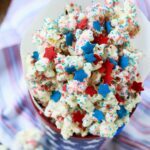 Firecracker Popcorn is coated in white chocolate and covered with patriotic sprinkles and Pop Rocks. The Pop Rocks make little explosions in your mouth! Pop microwave popcorn according to package directions. Pour popcorn onto baking sheet. Melt white almond bark according to package directions. Drizzle evenly over popcorn. Using your hands, coat the popcorn as evenly as possible. 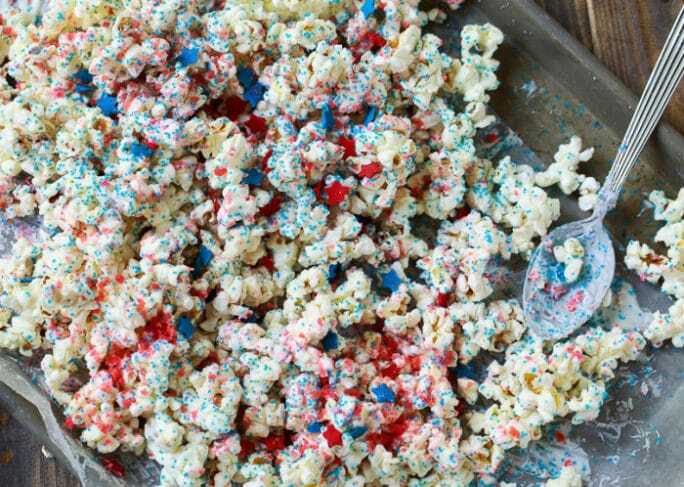 Sprinkle Pop Rocks and sprinkles over popcorn. Wait for white chocolate to set before serving. 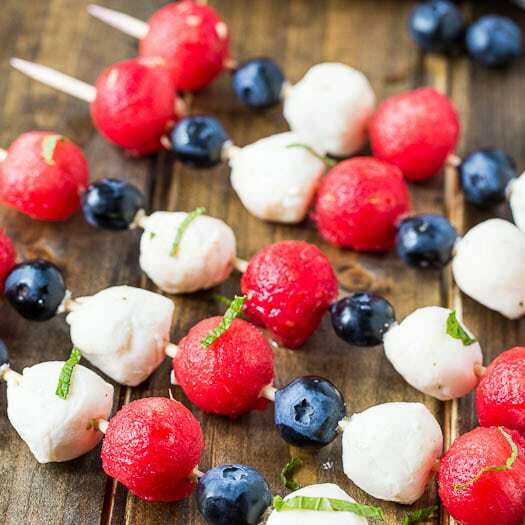 This entry was posted in Snacks and tagged 4th of July, pop rocks, popcorn. Bookmark the permalink. I’m looking for how to make firecracker crunch popcorn……can you tell me how ?? This is so fun, Christin! I don’t think this would be easy to walk away from! Oh my gosh, this is so adorable! I love how festive it is! 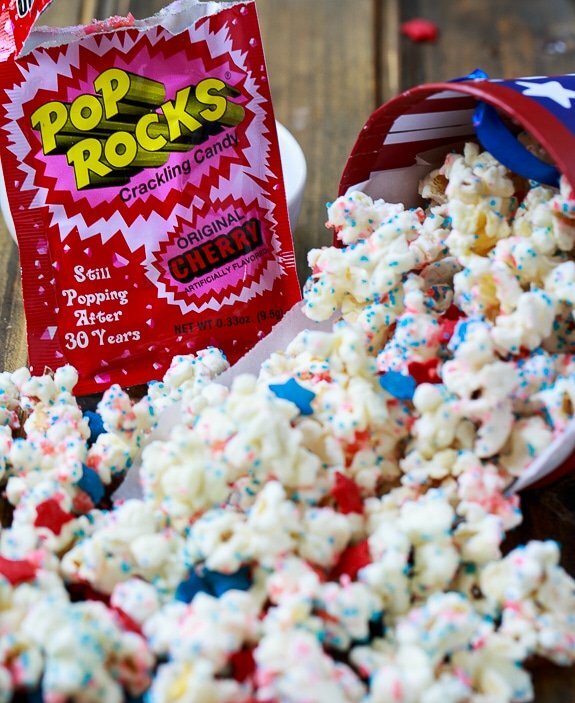 And adding pop rocks sounds like such a fun twist… fireworks in your mouth! I love white chocolate and popcorn, sweet and salty recipes are the best. I love that you added the Pop Rocks too, what a fun idea! Oh my gosh Christin! This is just such a ridiculously awesome idea! Stumbled and “yummed”! Pop rocks totally bring me back to my childhood! This popcorn sounds delicious, Christin! Love how festive it is! Pop rocks on popcorn?!?! My mind is blown. It has been way too long since I’ve had Pop Rocks! Pinning this to try later! 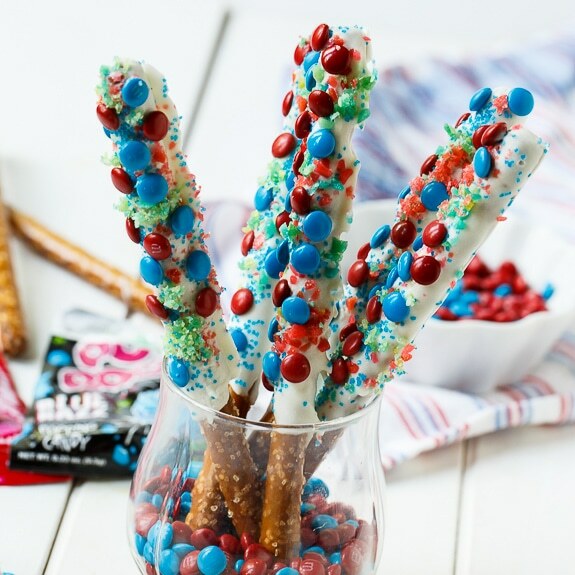 These firecracker treats are just so darn fun!! And with the white chocolate I bet this can be almost addicting!! 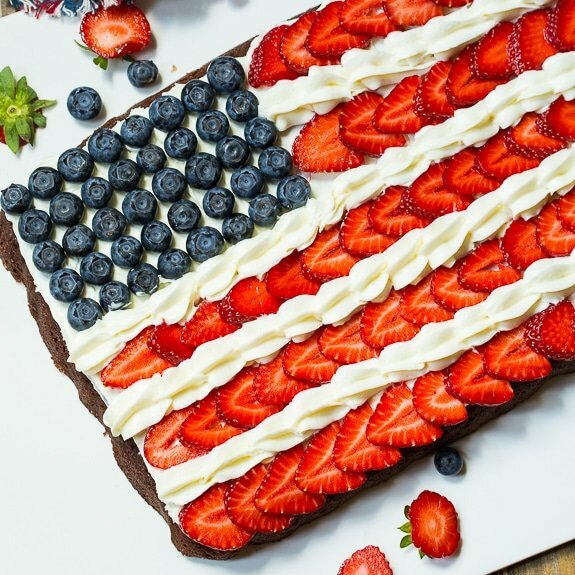 What a fun recipe to make for Independence Day! And what a great way to get the kids involved in the kitchen, too! I can see this going over wonderfully in my home, and I’m pinning this as a possibility for this coming weekend! Thanks for sharing. Oh my gosh, Christin! 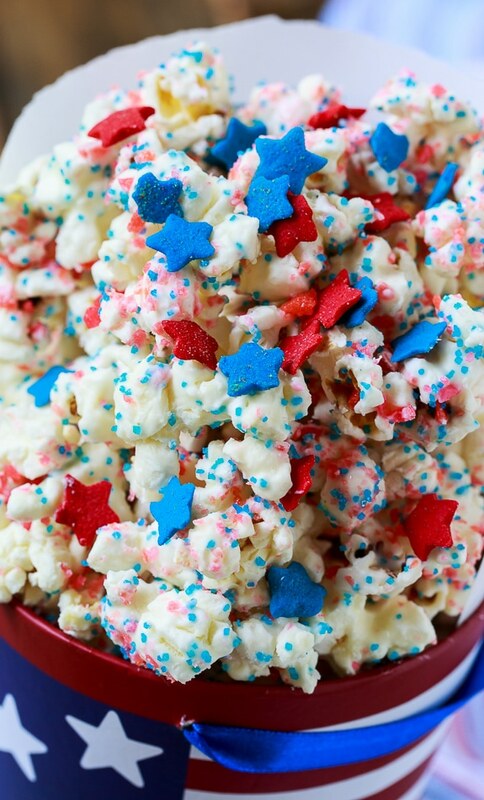 This popcorn is so so festive and perfect for the 4th! I so need to make this for the holiday weekend! Love white chocolate! This popcorn looks amazing! Pinned to try it for the holiday!